Skyfall, directed by Sam Mendes and starring Daniel Craig and Judy Dench, is quite simply amongst the best Bond films ever. James Bond (Craig) is missing presumed dead. A case he was working on went disastrously wrong leading to the identities of every active undercover MI6 agent being leaked onto the internet. As a result the ability and integrity of M, the department’s head, is questioned by the highest powers in Whitehall. When MI6 is itself attacked, it is up to Bond, who miraculously reappears just at the right time, to search for whoever, or whatever, is out to destroy the department and jeopardise Britain’s national security. Everyone has their favourite James Bond. For some there will only ever be the original Sean Connery. George Lazenbury was a promising blip who never really had the opportunity to establish himself in his one and only outing. Roger Moore’s Martini dry wit, along with an arch of his eyebrow, managed to get him out of the most farfetched and preposterous of predicaments, whilst Pierce Brosnan put his own mark on the character by effortlessly blending the best characteristics of his predecessors with his own brand of suave sophistication. As for poor old Timothy Dalton, well – let’s move on. Which brings us to Daniel Craig. Despite being credited with rejuvenating the flagging franchise with his hard edged, gritty, no-nonsense approach, for me he has never worked. Bond is meant to be fun and, no offence, but Mr Craig has never really looked like he appreciates his position as the most famous secret agent in history. He has the one job in cinema which most actors would die for, the least he could do is appreciate it. Well all that changes with Skyfall. Here Craig throws himself into his 007 role with everything from caustic wit to raw emotion on display, giving his character a humanness missing from his previous efforts. However it’s his supporting cast – and let’s be honest, everyone in a Bond movie plays a secondary role to the man himself – who really steal the show. The men – from a wonderfully wicked Javier Bardem as the evil villain Silva (whose past is full of dark links to 007’s department and provides one of the film’s most unnerving and gruesome sequences) to Ralph Fiennes and Ben Whishaw (whose characters of M’s boss and Q respectively may or may not become staple features of future films) – may be memorable, but its the women who linger once the film ends. From the feisty Naomie Harris who, as agent Eve, is more than a match for Bond, to the bewitching Bérénice Marlohe whose dragon-lady character Severine ranks amongst the most beautiful of a long line of Bond girls, it’s the women in particular who threaten to overshadow Bond. Even Helen McCrory stands out in a brief, but memorable, appearance as an irksome government minister. It’s Judi Dench though as M who is the best, given this time a pivotal role in a storyline which brings a new dimension to her relationship with her department’s most troublesome employee. Her repartee with Craig’s Bond shows genuine affection and concern which goes beyond a mere working relationship, and is genuinely moving towards the end. Released in a year when Bond’s native country celebrated the ‘great’ in Great Britain, it was only appropriate that one of its most famous (albeit fictional) heroes should stay on home soil. Reports said that the lack of exotic locations (in the past a staple of Bond films) this time round was due to budgetary constraints. However there looks to have been no expense spared as the whole thing drips class and style on the screen, whilst basing the majority of the action in iconic British locations gives the film an air of familiarity (and hence reality) missing from many of 007’s previous outlandish adventures. There were also concerns aired about the choice of director this time round. Though Sam Mendes is undeniably accomplished, as his Oscar winning American Beauty (1999) proved, he is more often associated human dramas than big action blockbusters. However, though this side to his work comes over strongly adding a fresh dimension not often seen in Bond films, he is clearly more than capable of handling the required action scenes as Skyfall‘s adrenalin pumping pre-credit opening and explosive finale prove. On the evidence seen here EON Productions will be missing a trick if they don’t hire him again for future instalments. It’s hard to review a film with so many plot points which are important to the understanding of the central character and why they have become what they are, without giving it all away. Welcomes, reacquaintances and goodbyes abound in a plot which is so full of genuine surprises and twists that this must rank as one of the sharpest and cleverest entries in Bond’s fifty year film career. The real test of a film is whether or not you’d want to sit through it again, particularly if it runs to nearly two and a half hours as Skyfall does. Well here I believe you could, as the time flies past in a blur of high octane action and explosive set pieces. 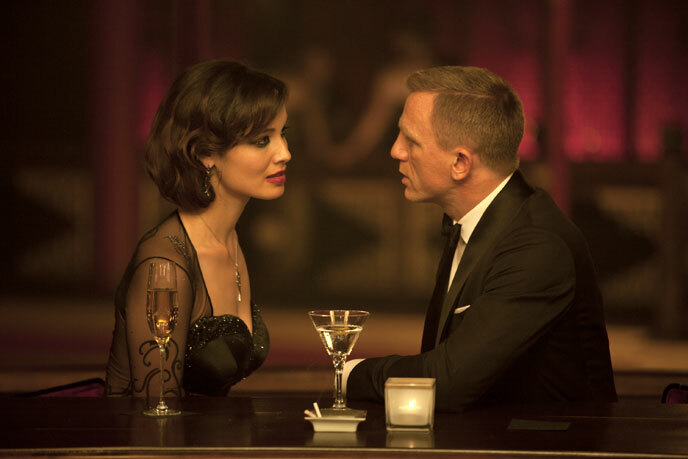 Whether that makes it a classic only time will tell, however, going on the evidence of Skyfall, the franchise looks safe for another fifty years – if only Craig could relax more and enjoy the ride with the rest of us.